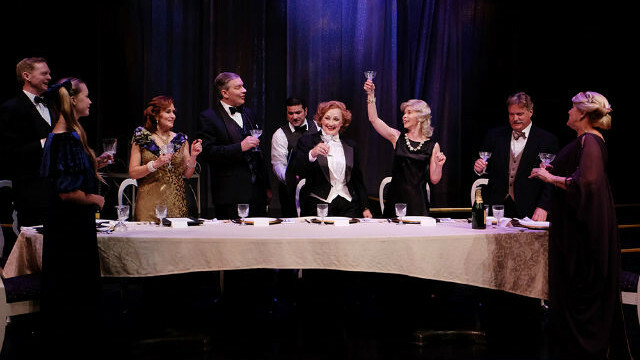 A scene from “Dinner with Marlene” at Lamb’s Players Theatre. He waited till he was 90 years old to tell anyone. Finally, not long before his death, Eric Hanes relayed the story to his daughter — of one unforgettable night in Paris, shortly after his marriage, when he met — and had dinner with — Marlene Dietrich and her high-end coterie. The daughter he told was Swedish-born Anne-Charlotte Hanes Harvey, long-time professor of theater at San Diego State University, frequent adaptor, translator and sometime playwright. It was too juicy a tale to pass up, though she put away her notes about her father’s story for quite some time. (His business trip, scheduled because he spoke French, came right after his marriage was a sore-point with his wife, so he waited till years after she was dead to tell the tale). A few years ago, Harvey came upon her notes and her interest was re-ignited. She researched the real characters her father had described, imagined some sprightly dialogue, and created a little intrigue to cap it off. 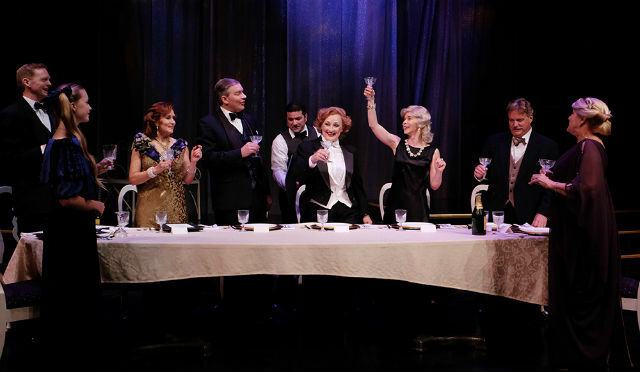 Now, “Dinner with Marlene” is having its world premiere at Lamb’s Players Theatre, under the assured direction of Robert Smyth. The year is 1938. The host at the snazzy “Tout Paris” restaurant at which Marlene (a sultry, tuxedoed Deborah Gilmour-Smyth) and a young Eric Hanes (stately, composed Brian Mackey) were guests, is Woolworth heiress Barbara Hutton (Rachael van Wormer, delightfully raucous and gauche), AKA The Countess von Haugwitz-Hardenberg-Reventlow, thanks to the second of her seven husbands. Hutton was the sole American of the group, which also included the famous German anti-war, anti-Nazi novelist (“All Quiet on the Western Front”) Erich Maria Remarque (suitably angry and tipsy Jason Heil), Marlene’s lover; the world-renowned Austrian-born violinist Fritz Kreisler (John Rosen, sober and sentimental), whose father happened to be Jewish; an enthusiastically pro-Nazi German nationalist, Bernadine Boubiel (frighteningly credible Cynthia Gerber); Maria Sieber, Dietrich’s precocious 13 year-old daughter (played with pitch-perfect attitude and aplomb by Escondido middle schooler Avery Trimm); and Leonore Wolff (a feverish, distracted Kerry Meads), owner of the posh hotel where all the guests were ensconced; she kept running out to deal with urgent ‘business’ about which we only learn much later, thanks to Eric, the awestruck narrator who fills us in on what came before and what happened after the events we observe. Eric was at the right place at the right time. Marlene had just sacked her governess, and needed someone to chaperone Maria for the day. She chose Eric, and in gratitude Ms. Dietrich invited him to dinner. Throughout the evening, Hutton keeps the champagne flowing but insists on a “no politics” policy at the table. Not a chance, since the Anschluss (German annexation of Austria) has just occurred, restrictions are already being placed on Jews, Poland and France will fall soon, and Kristallnacht (the wanton destruction of Jewish homes, businesses and places of worship) is only weeks away. There’s plenty of historical drama in the political setting; the extensive exposition is presented in imaginative ways, not only as conversation and narration, but through Maria, who may not have actually been present that night, but is portrayed as a collector and memorizer of facts, and a bit of a snoop, gossip and charmingly intrusive know-it-all. Still, there isn’t enough drama among the characters. Each has a secret, or a problem (the difficulty of obtaining visas, mostly), but there isn’t sufficient conflict, and the stakes, though perhaps heightened for the individuals, aren’t high enough for the audience. Every time there’s a potential conflagration between, say, Remarque and Boubiel, someone cuts it off with a quip or a toast. The play certainly presents a fascinating setup. The characters are interesting and uniformly well portrayed. There are even a few surprising reveals. But over 2+ hours, there’s no real arc, climax or resolution. Though the subject matter is historical, there is obvious relevance to today. With our own fiery national divisiveness, the play can be seen as a cautionary tale. The correspondences were not lost on the opening night audience. When Madame Boubiel says that the new leader “will make Germany great again,” the gasps and snickers of recognition were audible. So, we learn some history, we contemplate the downward spiral of a country, we make comparisons. The characters are well etched and well dressed (lovely costumes by Jeanne Reith), and situated in an opulent environment (elegant set by Mike Buckley, his 200th for Lamb’s Players Theatre). But we need to feel or care more for these people. No new play is perfect out of the gate. The next, trimmed and re-shaped version of this well-researched work should aim at our hearts as well as our heads. Performances are Tuesday-Thursday at 7:30 p.m., Friday-Saturday at 8 p.m., Saturday at 4 p.m., Sunday at 2 p.m.